The grave of Mike Burns, whose real name was Hoo-moo-thy-ah. He was the cousin of Carlos Montezuma. When he was a child he led the US Cavalry to Skeleton Cave where he witnessed the massacre of his people. Unidentified graves of the Yavapai who perished during the "Indian Wars". 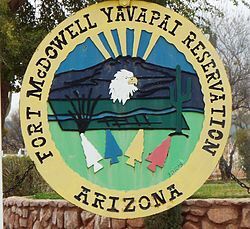 Wikimedia Commons has media related to Fort McDowell Yavapai Nation. ^ a b c "Yavapai History and Culture". Fort McDowell Yavapai Nation. Archived from the original on November 19, 2016. Retrieved November 19, 2016. 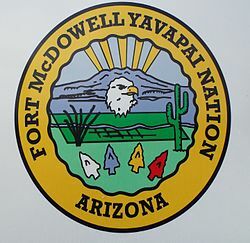 ^ a b c d "Fort McDowell Yavapai Nation". Inter Tribal Council of Arizona. Archived from the original on November 18, 2016. Retrieved November 19, 2016. ^ "Rodeo, Pow Wow at Fort McDowell". The Fountain Hills Times. November 18, 2016. Archived from the original on November 19, 2016. Retrieved November 19, 2016. ^ "Fort McDowell Orme Dam Victory Days Pow Wow". NativeAmerica.Travel. Archived from the original on November 19, 2016. Retrieved November 19, 2016. ^ "F.B.I. Agents Raid Casinos On 5 Indian Reservations". New York Times. May 13, 1992. Archived from the original on November 19, 2016. Retrieved November 19, 2016. ^ "Fort McDowell Yavapai Nation plan ground breaking for new casino". World Casino News. June 17, 2018. Retrieved June 17, 2018. 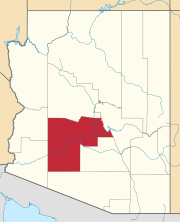 ^ "The Fort McDowell Yavapai Nation". Fort McDowell Resort Destination. Archived from the original on November 23, 2013. Retrieved November 19, 2016.